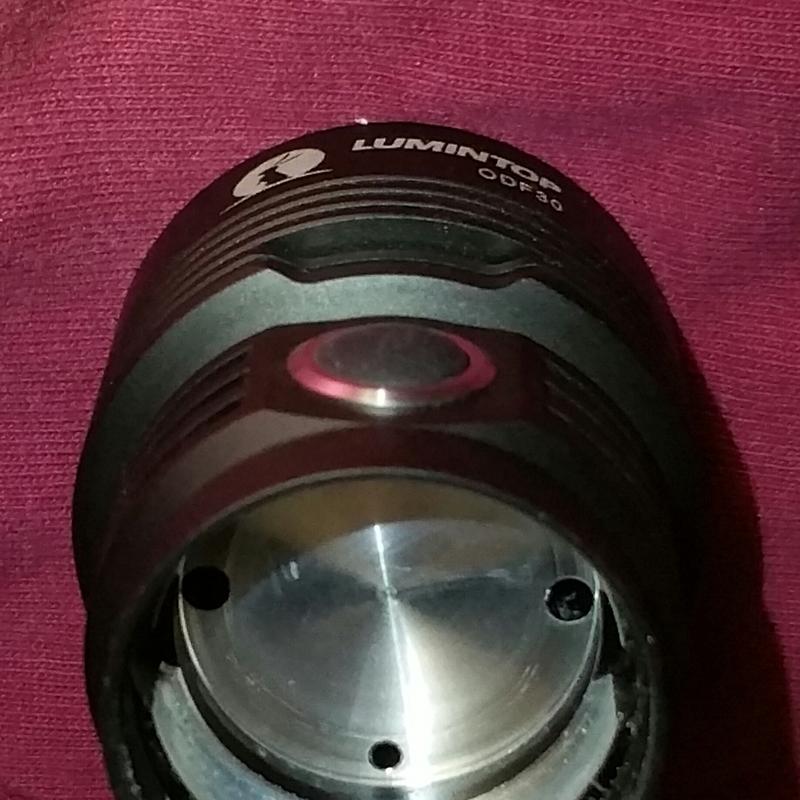 This is a review of the Lumintop ODF30 light. My model is the second version which has the spring on the driver. This is basically my review from their Amazon store where I gave it a 4 out of 5 star review. I decided to post it here a long with a few more details. This is my very first review so it’s not as extensive as others. Check out Locks review for more pictures and details. When I first opened the box I was actually surprised at how small it is. This light is borderline cute, but still packs a mean punch. I do have a light smaller than this called the DQG Tiny 7X (tan light in pics), but I feel that light is actually too small because it doesn’t fit in my hand well. I only get 3 fingers around it and two fingers hang off the end. 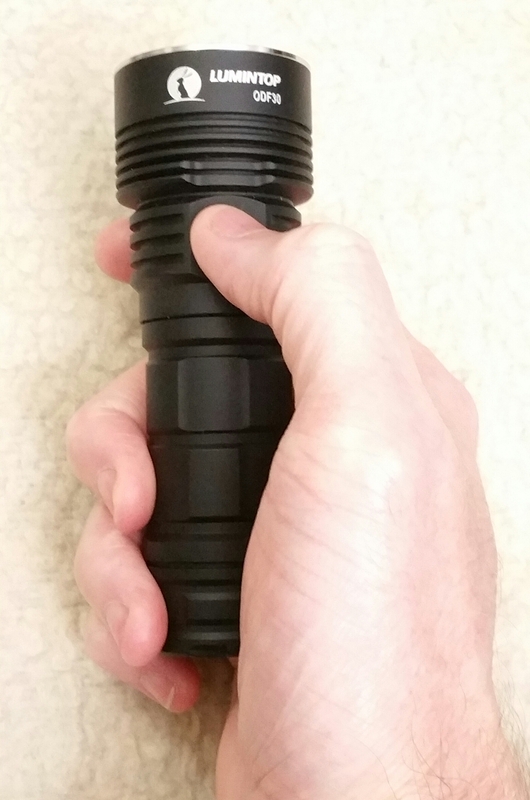 The ODF30 is similar in diameter, but longer so that I can get a nicer grip on it (4 finger grip). The finish is a velvety black anodization which I think feels really good in the hand. It also seems very slip resistant. Overall the ergodynamics feel really good, there are no sharp edges and the raised button is easy to find in complete darkness. The fit and finish seems superb and it has nice square cut threads on the tail cap. It uses a Cree xhp70.2 emitter and a single 26650 battery along with a boost driver to give it 5 brightness levels. The user interface is pretty good, but there is room for improvement. 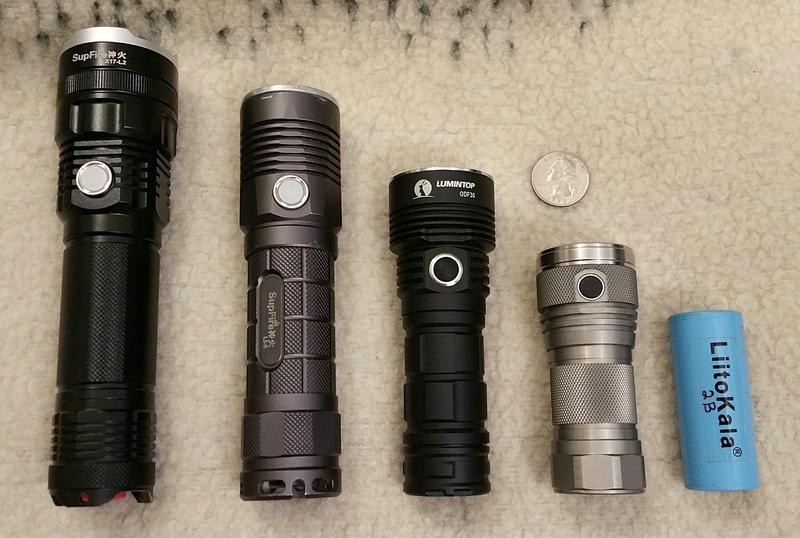 Eco, low and medium all seem pretty well spaced but in my opinion the high level of 1800 lumens is a little too high. I wish they could drop it down a bit to maybe 1100 lumen. This is just my opinion which may not be an issue for anybody else, so take this with a grain of salt. The other thing I didn’t like about the user interface is having to press and hold the button for one second to turn it off (yes, one second, not two as stated in the manual). I personally like to turn lights on and off with a single click. Again this may not be an issue for most people. Turn on is a fast click and you can cycle through low medium and high very quickly with a single click as well. Eco is only accessible from the off position using a press and hold. From the on position a double click goes to Turbo and then another single click goes back to your previous level. This light also has an electronic lock out only accessible from off. You just press and hold for about 4 seconds and you will get three or four very fast flashes. Now whenever the button is pressed you get temporary low mode for as long as you hold down the button. This is a unique lockout mode. The only way to unlock the light is to give the tail cap a half turn to break the connection and then turn it back to normal. Due to the anodized threads on the tail cap, you can give it half a turn to mechanically lock it out, which is what I prefer. The reflector size and beam pattern seem to give a really nice distribution of light for walking around at night. Although this is a cool white emitter, there are no signs of a blue or green tint. I also don’t see much yellow, so it’s a pretty pleasant white. 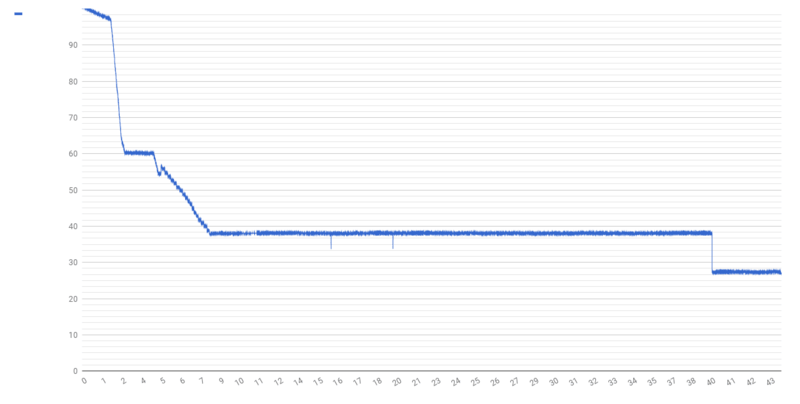 As far as output on turbo is concerned, I measured a tail cap amp draw (UNI-T UT210E clamp meter) of 9 amps using a blue Liitokala 5000mAh unprotected battery at 4 volts. Here is a list of all amp draws. I also used a JoshK sphere as well as a Texas Ace Lumen Tube with a .70 correction factor. So even though it’s difficult for an amateur like myself to give an exact lumen output for turbo, I think it’s safe to say it is in the 3100 to 3200 2700 to 2800 range. This is below the rated 3500 lumen, but should be more than bright enough for normal use. The sad fact is that very few lights realistically live up to there rated outputs. So I’m not taking a star off for that. For the most part I would give this light a 5 out of 5 star review, but it does have a couple of weaknesses that I have to take a star off. The fact the light doesn’t have any reverse polarity protection is a bit of an oversight. 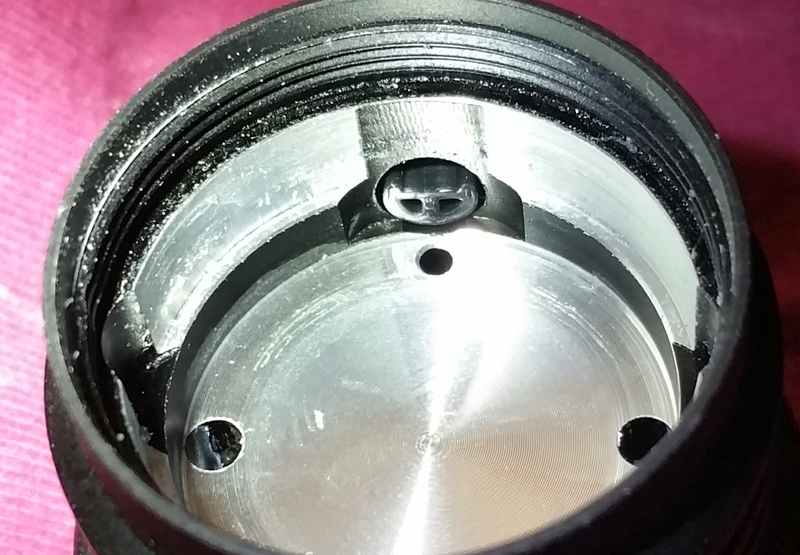 Most people should know that the battery always goes into the tube positive first so that the tail cap screws onto the negative end of the battery. 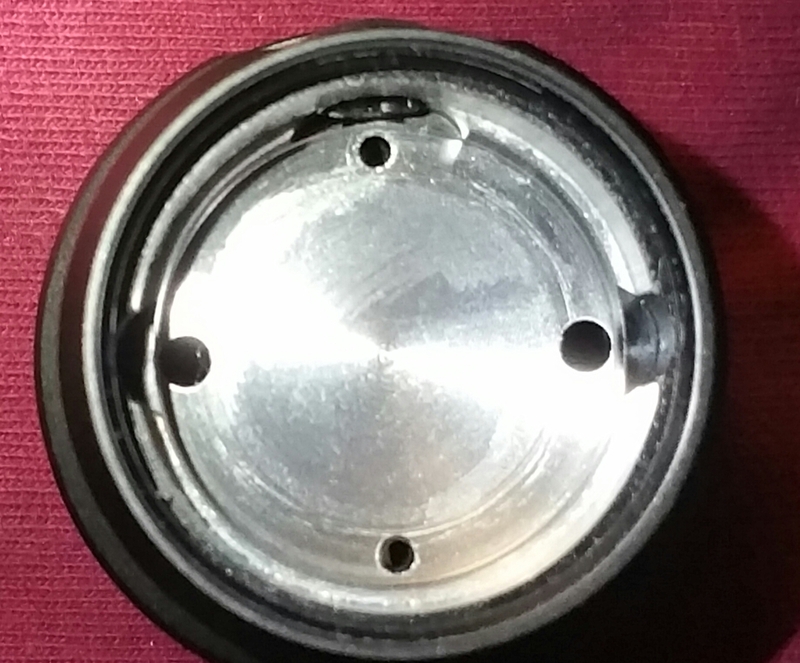 The instruction sheet for the light even shows a picture of the correct battery polarity, even though it could be a bit clearer. If you accidentally put the battery in backwards, you will end up damaging the light. 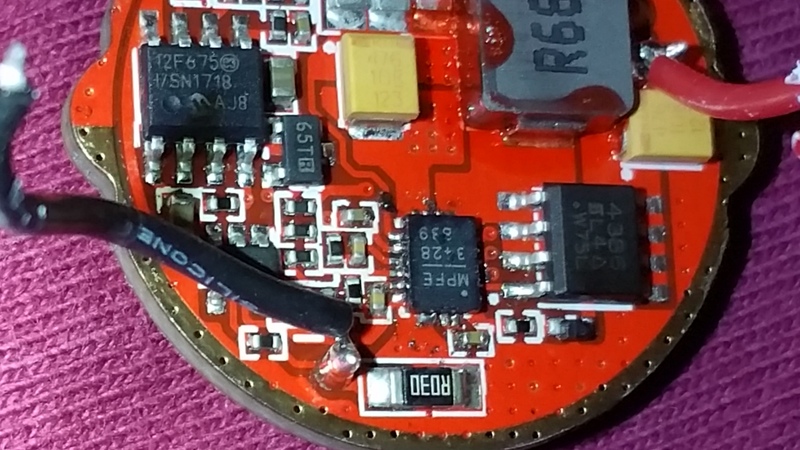 A second issue is it doesn’t fit certain protected 26650 batteries. 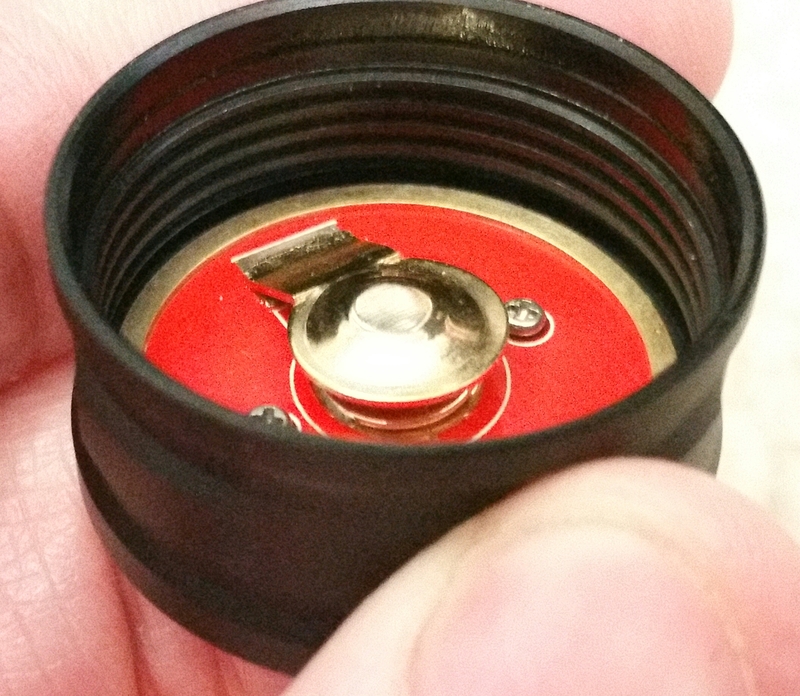 I’m told a 68.5mm long cell will fit, but I tried a 70.5mm and it did not. So even though lumintop recommends a protected battery for this light, only certain protected batteries will actually fit. All unprotected 26650 should work just fine. Just make sure the tab on the tail cap is not compressed down too far. So these two reasons (and maybe the user interface things I mentioned earlier) are why I’m giving it four stars instead of five. All of these issues are capable of being fixed by Lumintop in a later version so I’m hoping they will be corrected. I also want to make it clear that Lumintop sent me this light and asked for my honest review whether it be good or bad. I honestly feel this is a good light, but not a perfect one. There is still room to improve it. EDIT: Here is the Turbo runtime info. This is before I calibrated my Lumen Tube with Maukka’s light. My battery is not fully charged, but is still over 4 volts. Start was 3000 lumen and held steady for 1m 10s then slowly dropped to 1870 at the 1m 45s mark. It stabilized shortly then went down to 1700 at 2m. Then dropped to 1680 at 2m 15s. It held steady for a while then dropped to 1600 at the 3m mark. I turned it off as it was really hot. So I got full Turbo for 1m 10s, then I got a series of smooth ramp downs. Locks review showed the light staying above 2600 lumen (my lumen number, not his) for about 3 minutes before steeply dropping in output. Mine drooped to that level in half the time. His test says it was a 22°C room with no cooling. Mine was a 23°C with no cooling except my 2 fingers holding the light. My light was probably started off a bit warmer since it had just cooled down from another run on turbo about 10 mins earlier. Still, this is a pretty big difference in turbo stepdown times. I got 1m 37s of turbo before it ramped down. See here. good mini review i think u nailed whats good and whats bad. I really dont like tho that they rate 3500 lumens and it peaks a few hundred below better be honest about the actual lumens flux, i guess the host is to weak to really push that much no ? I know my olight r50 gets really hot at highest so i can imagine a host similar in size with 1000 more lumens wouldnt last long really. I’m not too bothered about the turbo output being below spec as you can’t see the difference between 3100 and 3500 lumen with your eyes. I would imagine the host is okay, but the driver is limited to about 35 watts. 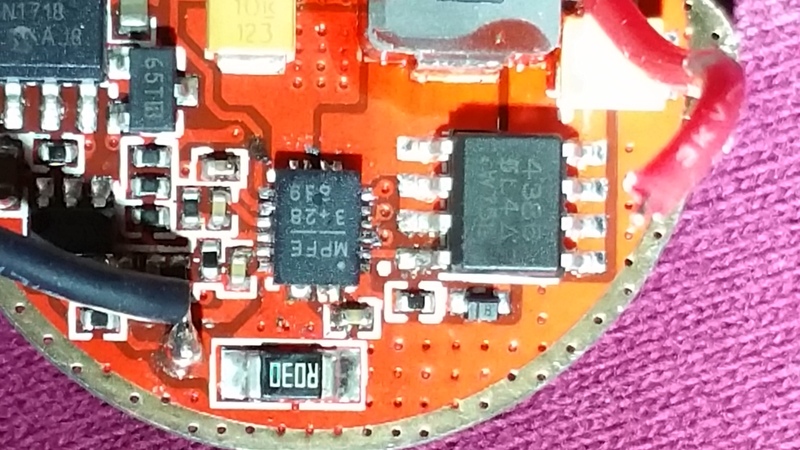 High powered boost drivers are difficult and expensive to build compared to normal constant current or FET drivers. 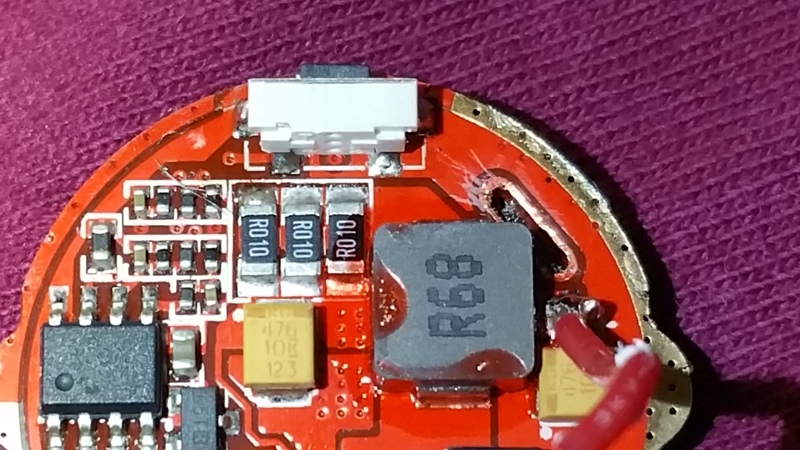 There may still be some voltage loss in the driver spring. 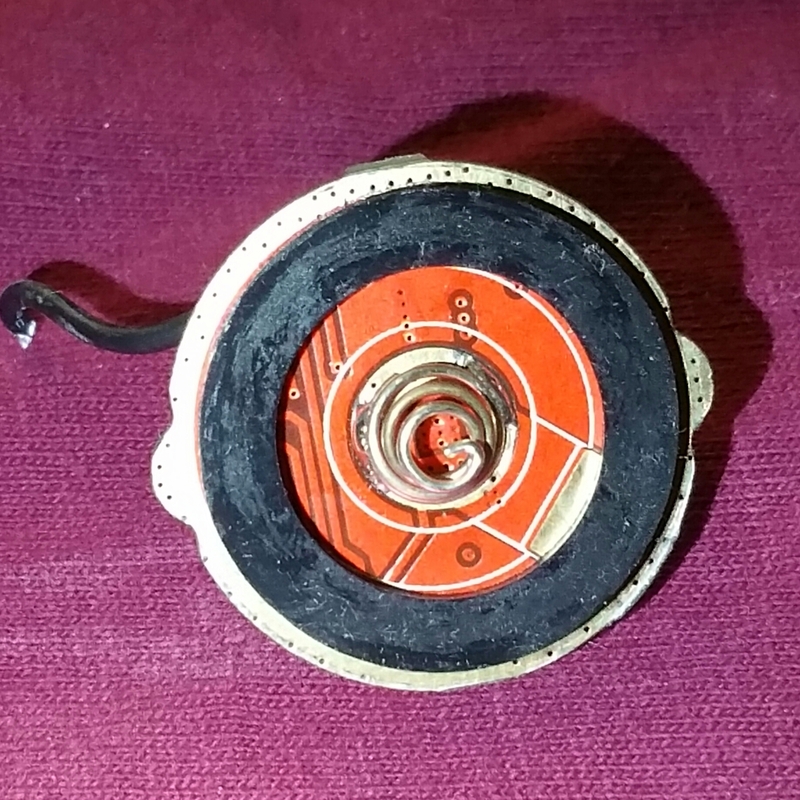 It’s a single spring and the battery tube is glued to the head. Once I get it open, I’ll bypass that spring and see if output increases. 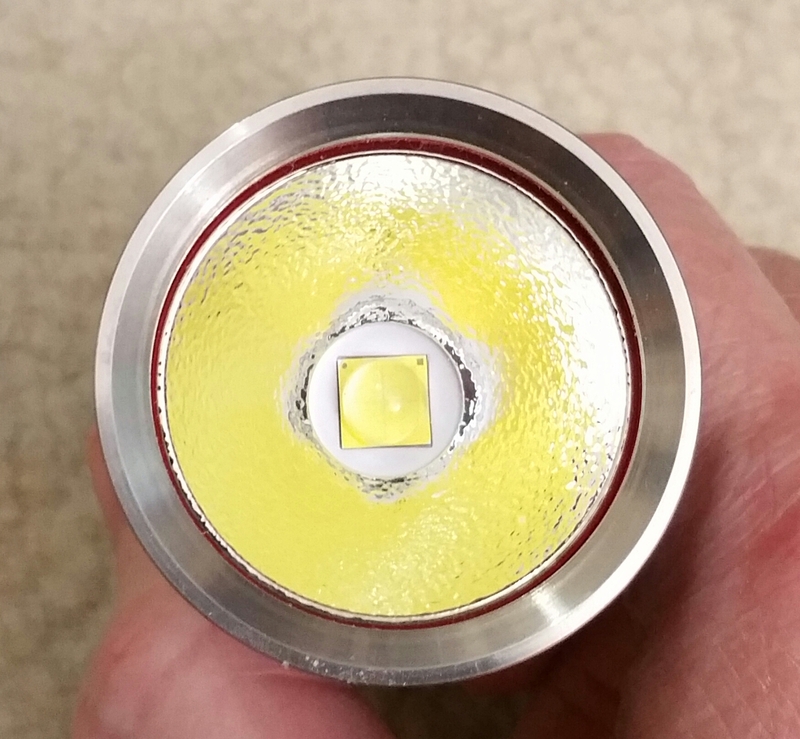 It’s quite possible it was doing closer to 3500 lumen with their earlier metal tab design. 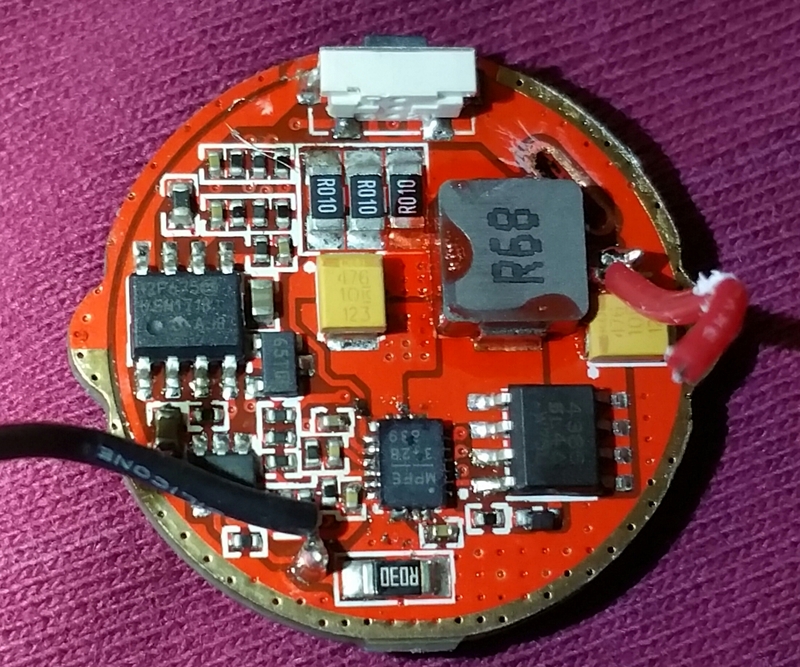 Lexel is working on his own boost drivers that are capable of serious output. He talks about the battery amp draws here. The current setting is limited at 18.8A from 19 (21A peak) the driver can sustain. Another resistor value can reduce the current. The ODF30 seems to have good built in thermal control so when it gets too hot it will drop from 9A to 6.4A (2100 actual lumens?). I need to test it out, but haven’t yet. Do you think I should contact banggood for new tailswitch?? It’s very strange for only one brightness level to stop working. Maybe your metal tab is bent down too much and it’s not pressing on the battery hard enough? Pry it up a few millimeters and see if that fixes turbo. I will try around lunch time.. it did go to turbo mode for one second and then back to high. I rarely use turbo.. maybe 32 seconds max.. it stopped working yesterday. I even cleaned the contact with the rubbing alcohol. Okay, going to Turbo for one second and then stepping down seems to be a very common issue when the battery is not squeezed hard enough. This happened to me after I tried to fit a protected battery in it. It also happened to some other people. What you need to do is bend the metal tab on the tail cap up. Then it will press on the battery harder and should resolve your problem. What Jason said! Had it happen on mine as well.. and the tab was the culprit. I did exactly what you guys tell me to do.. bend the spring to make longer. Now my turbo mode is working..
Like i said, i have been using acebeam 26650 protected, thrunite 26650, and shockli.. I wish they would use a double spring on both ends. Here we go.. i tested my lumintop odf30 with the shockli imr.. I use the correction factor of .70.. fenix tk15 1000 lumen light..
Wow… that’s much sooner than what was indicated in earlier reviews. I think lumintop program that way so the light will not be overheat.. Turbo should be way more than 30 seconds. 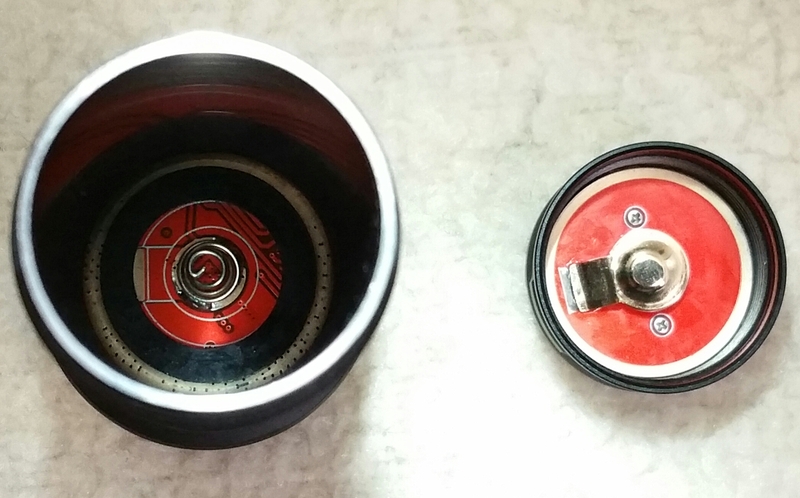 A simple test is to bypass the tail cap and use some heavy wire to ground the battery to the battery tube. If this makes it run for way more than 30 seconds then your battery might not be compressed tightly enough. My light is not even warm at 30 seconds. At 1 minute it’s getting pretty warm. At 1:30 it’s starting to get hot. I turned it down after 3 minutes. I think it gradually stepped down before 3 minutes as it was quite hot, but I didn’t notice it with my eyes. I’ll cool it down and run the test again using the light meter to see if it steps down. Okay, I tried again. My battery is not fully charged, but is still over 4 volts. Do you think we get longer turbo runtime in colder climate?? Yes, Lumintop says this light has intelligent temperature control which means it probably goes up and down based on the internal temperature as opposed to a step down after a certain time. If you blew cold air or ran it in an ice bath, I’m sure the turbo would last a lot longer. I have not tried to do this test, though. 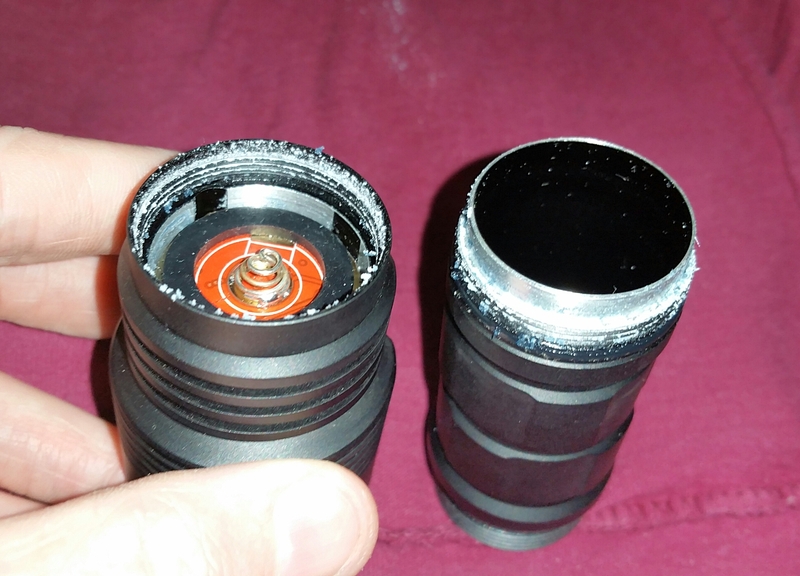 ok 30 seconds stepdown is a joke too me.. if the host is that weak or whatever reason then its just lame and misleading that it does the not even 3500 lumens for not even a minute.. lumintop has a thing or two to learn from olight. 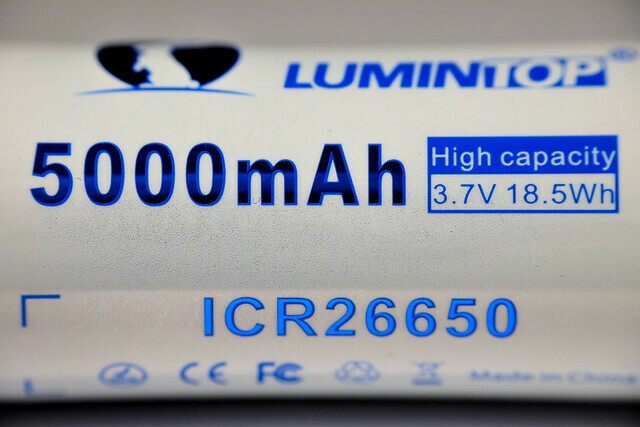 Lumintop if they read this should improve the light for newer batch.. Because for this price they ask its not worth it imo. JasonWW how about some video of outdoor beamshots? Thrunite TC20 operates in turbo for 150 seconds. I guess it’s a better option than lumintop. The turbo reaches 3,855 lumens. In high 1800 and it keeps practically all the time. Did you stop reading at post #11? If you look at post #15 I did a step down test and got 1 minute and 10 seconds before it slowly started ramping down. My light was already a bit hot, though. Reviewers like Lock got about 3 minutes before a big ramp down. You should read his review. He’s got all kinds of charts and graphs and pretty pictures. Also, ChibiM did a review here. He has some nice outdoor video. My only video camera is my Note 4 phone and the video is always too dark. I’m new to doing reviews, this is my first, so I’m lucky to pack as much info as I can here. The TC20 does not put out the rated turbo amount either. 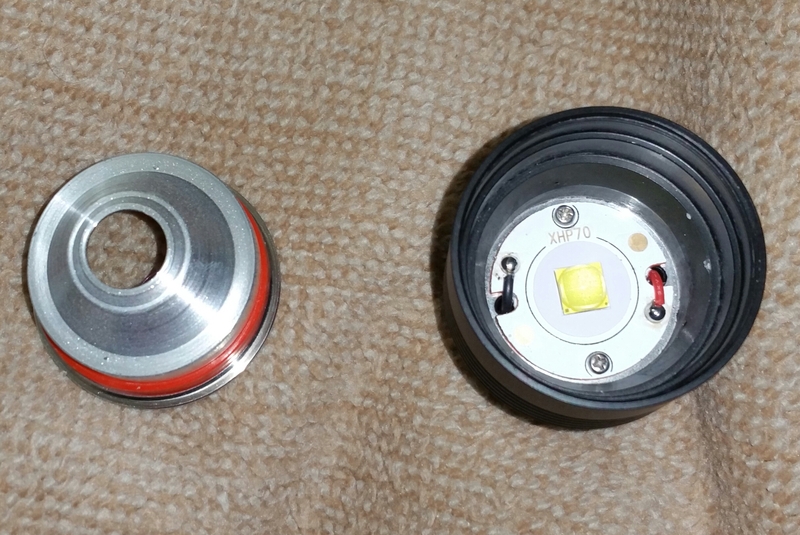 Newlumen has the same TA Lumen Tube I do and we both use the same 0.7 correction factor. 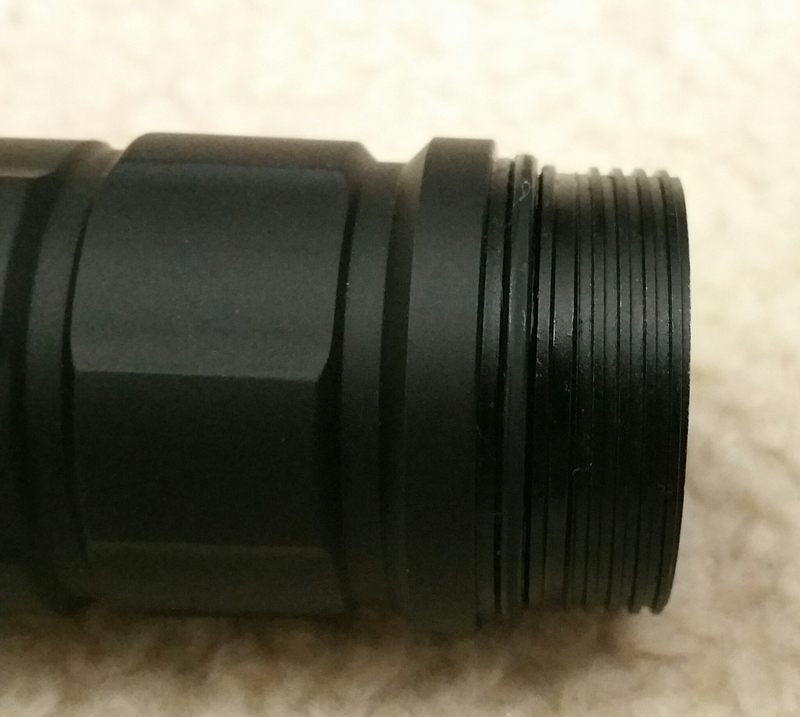 It puts out the same turbo lumens as the ODF30 (I actually measured 3150 @ 30 secs). So if you like the turbo brightness of the TC20, then you will also like the turbo brightness of the ODF30 as they are the same regardless of who’s integrating sphere is measuring it. 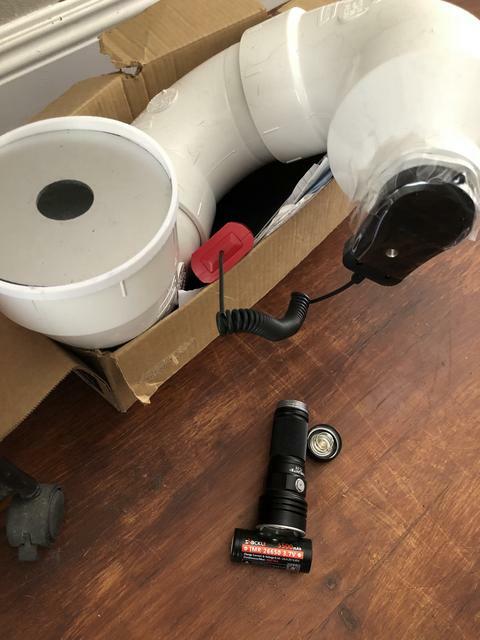 Hey i have a thrunite tc20 and lumen tube (using 0.7 correction factor) .. 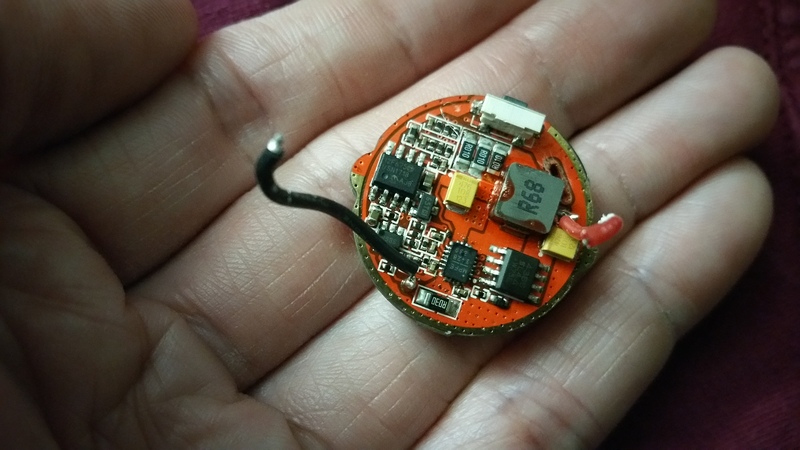 I tested it shockli imr.. 3.98 v at the time of testing. About how long it runs in turbo is still a bit confusing to me. On Totobel’s TC20 thread some say 2.5 minutes and some say 3 minutes. Some even said 30 seconds, but I think that was due to the Thrunite protected battery. My personal ODF30 started to ramp down at 1m and 10s and it wasn’t all that hot yet. Locks ODF30 started to ramp down after about 2.5 minutes. So I don’t know about actual turbo run time. This was never an issue to me as I don’t ever run turbo more than 15 to 30 seconds at a time anyway. If I need long run time at high outputs I have bigger lights to use. On the High level Lock measured the ODF30 running about 20 minutes before stepping down due to heat. Lumintop rates it at 1800 lumen, I measure it at 1500 lumen. I think maybe this is pretty close to the TC20. I asked Newlumen to measure his TC20 on high using is TA tube with a .70 correction factor. I will report back what he measures. He says it’s 1550 lumen. So pretty much the same as the ODF30. Overall, I’d say these 2 lights are pretty equally matched in overall performance on High and Turbo. I just did another Turbo run time test on my light since it was completely at room temperature (23° Celsius). This time I got one minute and 37 seconds before it started to ramp down. It was quite hot to hold, so I think it was stepping down at about the right time so as not to burn your hand. I think Turbo run time could be directly influenced by the battery that is being used. Lock was using an unprotected black KeepPower 5200 mAh battery which has quite a bit more voltage sag at 10 amp compared to the battery I’m using which is the Liitokala cyan 5000 mAH. My light might be heating up at a faster rate than Locks which activates the thermal step down sooner then on his light. This is just a theory at the moment. Pretty darn close to mine. What battery are you using? Since this uses a boost driver it seems to maintain steady output by increasing current. Check out Martin’s (M4dm4x) video. Ah, so your probably getting some amp draws over 10A with that battery due to the protection circuitry. Do you get a big drop in lumens from turn on to 30 secs in Turbo? 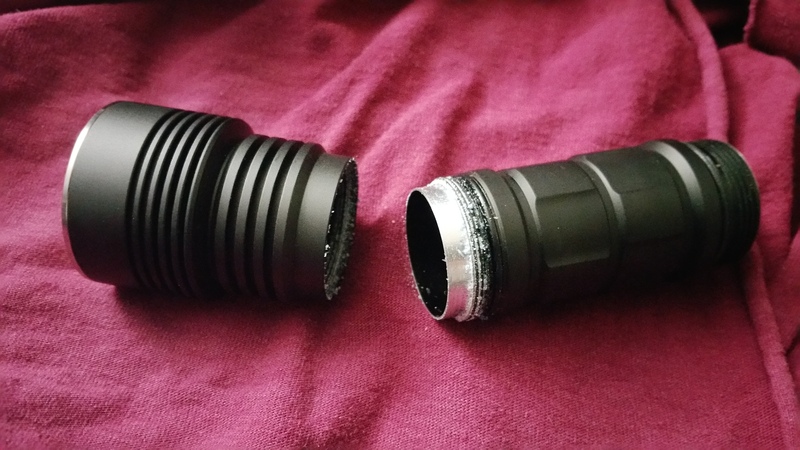 I’ve heard people with other lights say they get a 500 lumen drop due to the protection circuitry. That’s good to know. 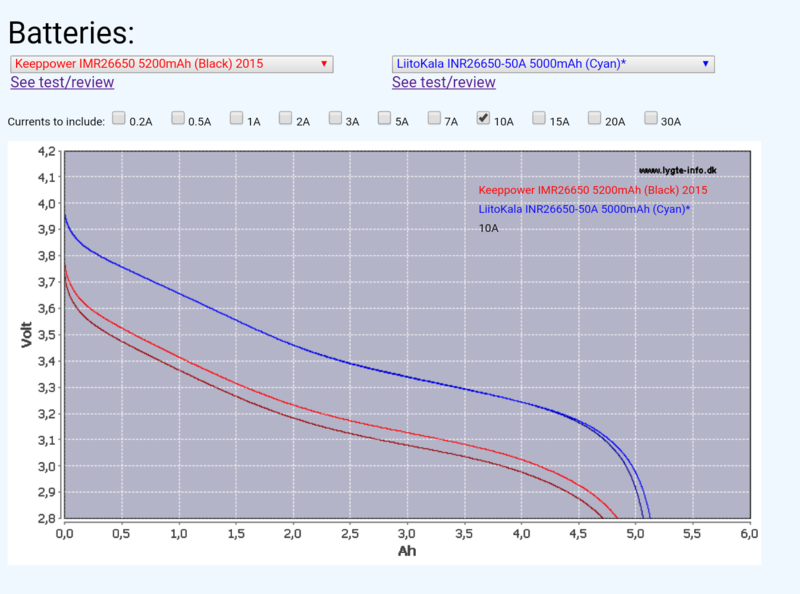 It seems the Lumintop protected 26650 can handle more amps/has less resistance than the Thrunite protected 26650. If turbo were reduced 500 lumen it would last longer before stepdown. Do people prefer that? Do people prefer a bigger and heavier light to get longer turbo runtime? I don’t know. I think this light has a pretty good balance between small size, light weight and still packs over 3,000 lumen. I haven’t tried any of its more expensive competitors, though. The MR70 looks pretty interesting. I built my own compact light with 2 × 26350 and FET driver with NarsilM. It is almost perfect for me. 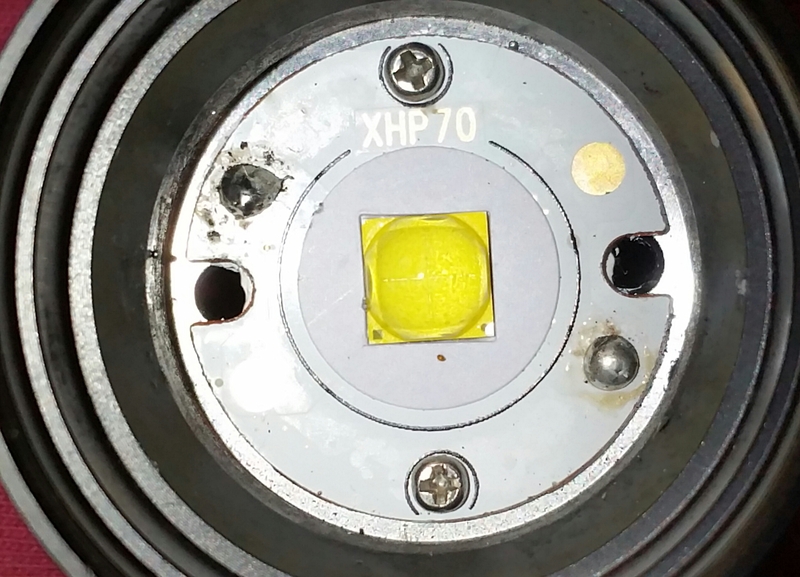 Hopefully Lexel can get NarsilM working on his boost drivers soon, then we will see real 3500 to 4000 lumen compact lights. I would say if u want to shine 3000+ lumens for more then a minute then u better of with an l6 ican use highest mode for several minutes it doesnt get that warm really. But some prefer smaller hosts even tho u can only run a minute its already very hot so yea u have to chose. Mine does step down a little before 2:00 minutes. It used to step down within 10 seconds.. sometimes even within 3 seconds. Until Jason came to the rescue.. now its doing the step down correctly. But still not at 3 minutes. Here is a world exclusive. I got the battery tube apart. Yay! I used a leather welding glove and a vice being careful not to distort the battery tube. Then I used a hot air gun to heat the light up. I eventually worked my way up to a rubber strap wrench and then just barely got it to break loose. They use some pretty wicked blue looking threadlocker that dries to a white finish. I suspect this is the same driver and switch design as the Lumintop GT Mini.